Introducing CRM 3.0, a new marketing and sales management model that integrates and extends prior approaches to CRM to unleash the potential of customer relationships. 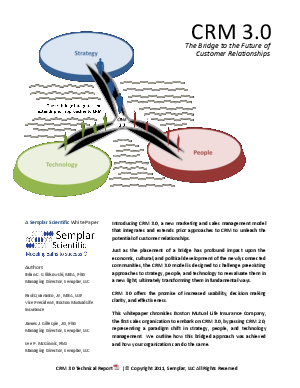 Just as the placement of a bridge has profound impact upon the economic, cultural, and political development of the newly connected communities, the CRM 3.0 model is designed to challenge preexisting approaches to strategy, people, and technology to reevaluate them in a new light, ultimately transforming them in fundamental ways. CRM 3.0 offers the promise of increased usability, decision making clarity, and effectiveness.